The Washington IIB District 9 Track and Field Championship began today in Idaho. To some foreigner from, say, Seattle, that might seem odd but living on top of a border alters the way you look at towns around you. Intellectually, we understand the University of Idaho isn’t in our state, but, in practice, they’re a close neighbor, as is the City of Lewiston.So the event is being held at the recently renovated (2012)Dan O’Brian Trackon the U. of Idaho campus. Idaho staff demonstrated their competence and were very helpful getting all the systems –power, sound, and such – up for the teams. Field events started promptly at 4PM and the running events were close. 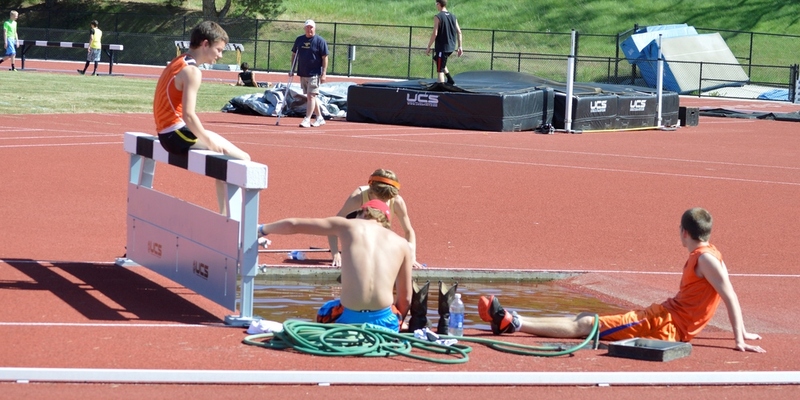 The meet is spread over two days to allow the athletes an opportunity to recover from multiple events. The top three go to the State meet. The first running event, the women’s 4x200m relay saw Asotin, with Sarah Nicholas anchoring the squad, win handily though DeSales refused to quit. An intense battle between TO-GP and St. John-Endicott for the fourth slot wasn’t decided until the last five meters as Katie Holbrook (TO-GP) and Jazmyn Ray (St. John) swapped placements on the last straightaway, with Holbrook having just a touch more speed at the finish. The ladies at Walla Walla Valley Academy secured third place. The next event, the women’s 3200m was not nearly as close as Lucy Eggleston (Asotin) ran a smart tactical race in the warm conditions for the first five laps before opening up a large gap on Heather Siegel (St. Johns) and exploding on the last lap. Emily Adams of Waitsburg-Prescott continued her solid freshman season by taking third, headed for State, likely not for the last time. 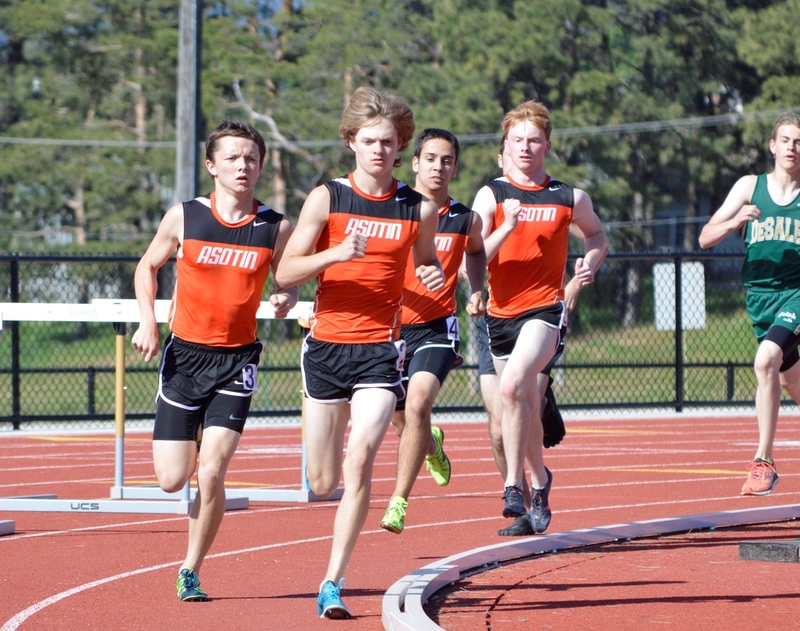 The men’s 1600m was dominated by the Asotin squad. Headed into the final lap, Asotin had runners in the top five positions, all poised to break 5:00. Chandler Tiegan led them all from start to finish, virtually unchallenged. Thomas Weakland took second with Brian Strobel uncorking a powerful kick to round out the state entries. On a side note, one of the Asotin runners went down in the heat. I’d like to thank EJ Meserve of Waitsburg-Prescott. While Cap Perry, the TO-GP coach, seeing the situation, hollered at me to direct me into their camp for water, EJ had already grabbed a cup and was handing it to the Asotin young man. Good and fast thinking for an athlete who, seconds before, had been running the mile. If anybody knows EJ or the Waitsburg coach, give them a thumbs up. Off to the intermediate hurdles, men first. Owen Lanning (Waitsburg) and Wesley Hendrickson (WWVA) followed up last week’s close race with another beauty, Lanning winning again. I think Sergio Alexis Pena was third but I was distracted by the battle up front and didn’t refocus on time. In the field events, we led off with women’s javelin, men’s triple jump, men’s shot, and women’s pole vault. For the second half of the afternoon, we flipped men’s events for women’s. Results aren’t up (as yet – I’ll update as new info comes in) on Athletic.net but there was a nice competition in the women’s javelin between Dayton’s Kaitlyn Andrews and Annie Bailey (St. John). Piper Loop was her usual dominating self in the women’s shot and had a good set of puts, perhaps season bests, just in time for the state meet. Skylar Olsen (Desales) looked good, too. Emily Adams (Waitsburg) showed surprising (to me, at least) hops in the women’s triple jump. Olivia Pakootas looked good but the couple of jumps I saw were a little short of her usual but I only caught two of the six jumps as I drifted to the men’s javelin. Update: Kaitlyn Andrews (Dayton) edged out Olivia Pakootas by 4" to win the triple jump. Rachel Gfeller (St John) took third and is headed to State. Cody Whitmore, if I heard correctly, blasted a javelin throw of 150+ feet which would be a new PR for the young man. Update: Cody threw 153'08" while brother Dirk threw 149'02". Dayton Krull completed the sweep for Asotin. The men’s shot put was very competitive with the Waitsburg men putting pressure on a traditional Asotin strength in the power event. Nate Barlow and Zion Branson (Waitsburg) took second and third while Jacob Swearingen (Asotin) won. That’s it for now. I’ll get numbers into the report when I have them. Thanks to Sal Lopez for giving me permission to get on the infield to take some of these photos. He called me 'media'. You guys deserve better but, still, we're making progress.